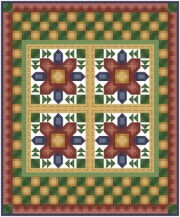 The floral 'quilt block' at the center of this cross stitch quilt pattern has a French Country flair. Stitched using an antique color palette, this pattern would make a wonderful addition to any country themed decor. With Supplies: $19.47 You download the design. We will send you, 11 skeins of DMC Floss & Wichelt 14ct. 18" x 21" Aida (Ivory) to complete your project.